Europe's next polar-orbiting weather satellite was shipped from France to Kazakhstan on Tuesday, where it will be tested, fueled and bolted to a Soyuz rocket for liftoff in May. The MetOp B satellite will join a network of satellites providing global weather coverage for medium- and long-term forecasting. Its launch is scheduled for May 23 at 1628 GMT (12:28 p.m. EDT) from the Baikonur Cosmodrome aboard a Soyuz 2-1a rocket with a Fregat upper stage. 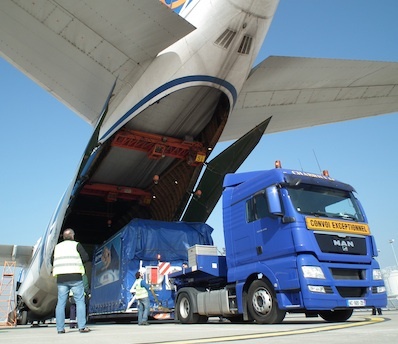 MetOp B flew to Kazakhstan inside an Antonov cargo plane from its Astrium factory in Toulouse, France. The satellite arrived at the Baikonur Cosmodrome on Tuesday, according to Roscosmos, the Russian space agency. Once the craft is launched into a 507-mile-high sun-synchronous orbit, MetOp B will activate its weather observation payload and enter service. MetOp B is the second of three MetOp satellites built by Astrium. MetOp A launched in October 2006, and MetOp C is due for launch in 2016, according to the European Space Agency. 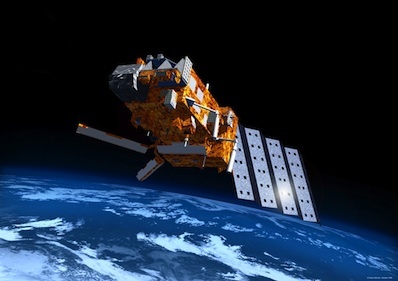 The weather satellite program is a joint effort between ESA and the Eumetsat, or the European Organization for the Exploitation of Meteorological Satellites. The program's three satellites, launch vehicles, ground segment and flight operations are projected to cost 2.7 billion euros, or nearly $3.6 billion, adjusted for inflation to 2011 levels. ESA pays for development of the satellites and their launches, while Eumetsat funds operations and ground systems. Europe's MetOp constellation is part of a collaborative program with NOAA, the U.S. weather agency, to share data from polar-orbiting satellites. Observations from two types of polar orbits, timed to cross the equator at 9:30 a.m. and 1:30 p.m. local time, are useful in obtaining data to improve weather prediction and the understanding of climate change. The MetOp fleet covers the morning orbit, while NOAA's satellites fly in the afternoon orbit. Instruments aboard the MetOp satellites come from ESA, Eumetsat, NOAA and CNES, the French space agency.